The Spinner S7 and Spinner S5 Indoor Cycling Bikes are designed for performance and comfort, allowing you to workout for longer in the comfort of your own home. 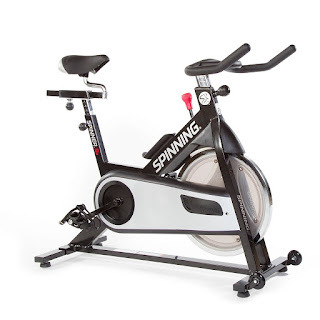 Both the Spinner S7 and Spinner S5 spin bikes utilize a perimeter weighted flywheel for smooth consistent cycling along with a chain drive system for a true road-bike feel. 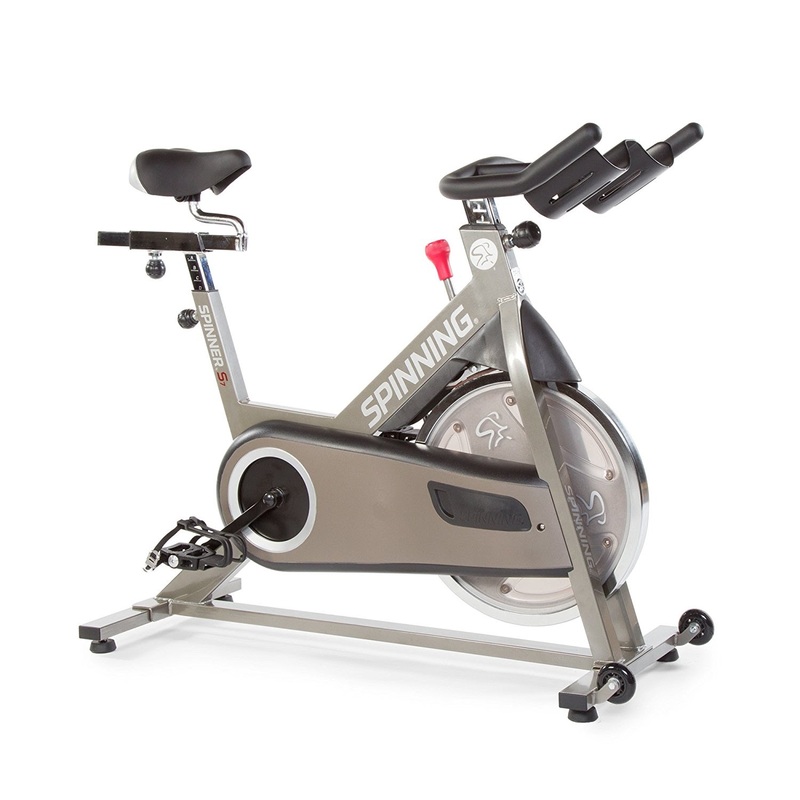 The Spinner S7 is the higher-end indoor cycle over the S5 and has a heavier flywheel at 35 lbs compared to the S5’s 31 lb flywheel. 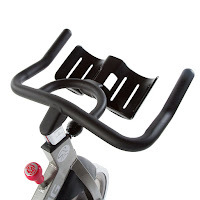 The heavier flywheel generally equates to more consistent momentum in exercise bike terms. 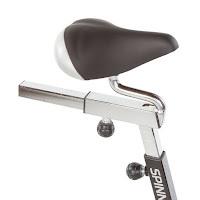 Both the Spinner S7 and Spinner S5 Indoor Cycles feature a friction resistance system with a micro-adjustable turn-knob, along with an easy-to-use push-down emergency brake with leather pad. The leather pad is generally more hard-wearing than felt pads for longer-lasting durability. The Spinner S7 and Spinner S5 spin bikes are both ergonomically designed with full adjustability for a custom fit for different riders. The wide saddle is padded for user comfort and is adjustable both up/down and fore/aft. The large-diameter commercial-sized handlebars feature multi-position non-slip grips and are also height adjustable. The adjustability of both these Spinner indoor cycles makes the S7 and S5 suitable for a range of rider heights from 4ft 10” tall up to 6ft 7” tall. The Spinner S7 and S5 also both offer a narrow Q-factor of 147 mm. The Q-factor is the distance between the pedals and the narrow design of these spin bikes is closer to a true road bike, giving you a more natural cycling feel which is easier on your knees. Both the Spinner S7 and S5 Indoor Cycles come with dual-sided pedals, i.e. cage and SPD compatible. The pedals have standard threads so you can easily swap them out for pedals of your own choice if preferred. Notice the difference in the placement of the water bottle holder between these 2 Spinner bikes – the S7 has commercial-style dual water bottle holders located on the handlebars whereas the S5 has a single molded water bottle holder located on the bike’s frame. Both Spinner bikes are built with a sturdy and durable powder-coated steel frame, with the S7 finished in a titanium color and the S5 finished in a charcoal color. Both bikes allow for a maximum recommended user weight capacity of up to 250 lbs. The Spinner S7 and S5 Indoor Cycling Bikes are designed with the same small foot print so won’t take up much space in your home, but as you would expect the S7 weighs slightly more overall as it has the heavier flywheel. Both spin bikes feature easy-to-adjust stabilizer feet for levelling on uneven floors for added stability. Both bikes also come with front-mounted transport wheels for easy relocation. As an added bonus, both the Spinner S7 and S5 come with 4 spinning DVDs to help you get the best out of your workouts including Ultimate Energy, Train & Tone, Turn & Burn, and Maximum Results. Spin bikes are designed for serious athletes looking for indoor cycle training. There are typically no frills with spin bikes such as pre-set programs etc that you would get on an upright exercise bike. Instead, you are in control – cycle as fast as you want, stand up or sit down as you cycle, and adjust the resistance and use the push-down brake to simulate real road biking. The chain-drive on both the Spinner S7 and Spinner S5 give these indoor cycles even more of an authentic road-bike-feel cycling experience in the comfort of your own home. The adjustability of both these bikes is designed to give riders a personalized fit, while the quality of the build and components offer high performance and a smooth ride. 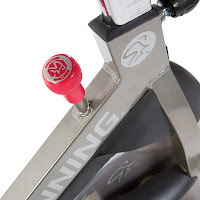 The Spinner is S5 is suitable for both beginners and intermediate cyclists, while the S7 with its heavier weighted flywheel is suitable for beginners, intermediate and advanced cyclists.